Canned sardines. I must say my savior. And sardine is actually quite a favorite as well in my house. Overall too, when we speak about Spicy Sardine Sambal With Potatoes? Tell me about spicy sardine alongside floods/banjir of Rasam on rice. Pow-wow right? All fingers swimming in rasam and spicy sardine, of course potatoes mashed in as well when tucking in? Mouthwatering right? 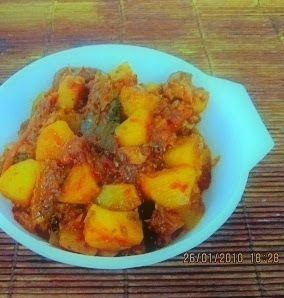 Spicy Sardine Sambal With Potatoes. I know. My pictures are quite disheartening, but my recipe I vouch is not. Believe me. 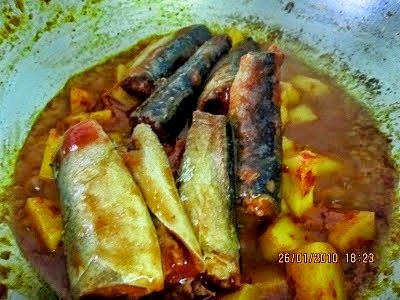 Make this my style to Spicy Sardine Sambal With Potatoes for your food love and you will believe in me deeply. Stir and simmer till aromatic. 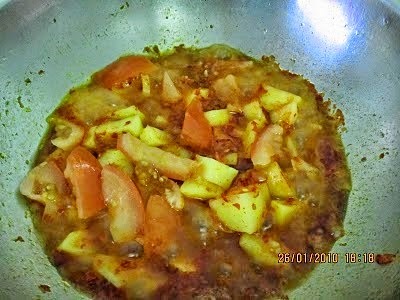 Add potatoes, tomatoes, tamarind juice, salt and enough water for gravy and to cook the potatoes. Next add sardines. Stir till gravy thickens.